^ The Hubble Heritage team. Hubble Images a Swarm of Ancient Stars. HubbleSite News Desk (Space Telescope Science Institute). 1999-07-01 [2006-05-26]. ^ Harris, William E. CATALOG OF PARAMETERS FOR MILKY WAY GLOBULAR CLUSTERS: THE DATABASE. February 2003 [2009-12-23]. ^ Frommert, Hartmut. Milky Way Globular Clusters. SEDS. August 2007 [2008-02-26]. ^ 4.0 4.1 Ashman, Keith M.; Zepf, Stephen E. The formation of globular clusters in merging and interacting galaxies. Astrophysical Journal, Part 1. 1992, 384: 50–61. Bibcode:1992ApJ...384...50A. doi:10.1086/170850. ^ Dauphole, B.; Geffert, M.; Colin, J.; Ducourant, C.; Odenkirchen, M.; Tucholke, H.-J. ; Geffert; Colin; Ducourant; Odenkirchen; Tucholke. The kinematics of globular clusters, apocentric distances and a halo metallicity gradient. Astronomy and Astrophysics. 1996, 313: 119–128. Bibcode:1996A&A...313..119D. ^ Barmby, P.; Huchra, J. P. M31 Globular Clusters in the Hubble Space Telescope Archive. I. Cluster Detection and Completeleness. The Astronomical Journal. 2001, 122 (5): 2458–2468. Bibcode:2001AJ....122.2458B. arXiv:astro-ph/0107401. doi:10.1086/323457. ^ McLaughlin, Dean E. ; Harris, William E.; Hanes, David A. The spatial structure of the M87 globular cluster system. Astrophysical Journal. 1994, 422 (2): 486–507. Bibcode:1994ApJ...422..486M. doi:10.1086/173744. ^ Harris, William E. Globular cluster systems in galaxies beyond the Local Group. Annual Review of Astronomy and Astrophysics. 1991, 29 (1): 543–579. Bibcode:1991ARA&A..29..543H. doi:10.1146/annurev.aa.29.090191.002551. ^ Dinescu, D. I.; Majewski, S. R.; Girard, T. M.; Cudworth, K. M. The Absolute Proper Motion of Palomar 12: A Case for Tidal Capture from the Sagittarius Dwarf Spheroidal Galaxy. The Astronomical Journal. 2000, 120 (4): 1892–1905. Bibcode:2000astro.ph..6314D. arXiv:astro-ph/0006314. doi:10.1086/301552. ^ Lotz, Jennifer M.; Miller, Bryan W.; Ferguson, Henry C. The Colors of Dwarf Elliptical Galaxy Globular Cluster Systems, Nuclei, and Stellar Halos. The Astrophysical Journal. September 2004, 613 (1): 262–278. Bibcode:2004ApJ...613..262L. arXiv:astro-ph/0406002. doi:10.1086/422871. ^ 11.0 11.1 van den Bergh, Sidney. Globular Clusters and Dwarf Spheroidal Galaxies. Monthly Notices of the Royal Astronomical Society, in press. November 2007, 385 (1): L20. Bibcode:2008MNRAS.385L..20V. arXiv:0711.4795. doi:10.1111/j.1745-3933.2008.00424.x. ^ Sharp, N. A. M22, NGC6656. REU program/NOAO/AURA/NSF. [2006-08-16]. ^ Boyd, Richard N. An introduction to nuclear astrophysics. University of Chicago Press. 2008: 376. ISBN 0-226-06971-0. ^ Frommert, Hartmut; Kronberg, Christine. 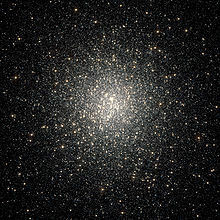 Clobular Star Clusters. The Messier Catalog. SEDS. [19 June 2015]. （原始内容存档于2015-06-19）. ^ Ashman, Keith M.; Zepf, Stephen E. Globular cluster systems. Cambridge astrophysics series 30. Cambridge University Press. 1998: 2. ISBN 0-521-55057-2. ^ Shapley, Harlow. Globular Clusters and the Structure of the Galactic System. Publications of the Astronomical Society of the Pacific. 1918, 30 (173): 42+. Bibcode:1918PASP...30...42S. doi:10.1086/122686. ^ Hogg, Helen Battles Sawyer. Harlow Shapley and Globular Clusters. Publications of the Astronomical Society of the Pacific. 1965, 77 (458): 336–46. Bibcode:1965PASP...77..336S. doi:10.1086/128229. ^ The Very Large Telescope discovers new kind of globular star cluster. Astronomy. May 13, 2015 [May 14, 2015]. ^ Piotto, G.; 等. A Triple Main Sequence in the Globular Cluster NGC 2808. The Astrophysical Journal. May 2007, 661 (1): L53–L56. Bibcode:2007ApJ...661L..53P. arXiv:astro-ph/0703767. doi:10.1086/518503. 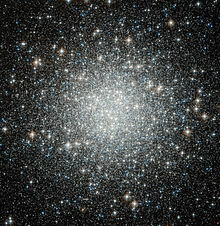 ^ Chaboyer, B. Globular Cluster Age Dating. Astrophysical Ages and Times Scales, ASP Conference Series 245: 162–172. Bibcode:2001ASPC..245..162C. ^ Piotto, Giampaolo. Observations of multiple populations in star clusters. The Ages of Stars, Proceedings of the International Astronomical Union, IAU Symposium 258. June 2009: 233–244. Bibcode:2009IAUS..258..233P. doi:10.1017/S1743921309031883. ^ Weaver, D.; Villard, R.; Christensen, L. L.; Piotto, G.; Bedin, L. Hubble Finds Multiple Stellar 'Baby Booms' in a Globular Cluster. Hubble News Desk. 2007-05-02 [2007-05-01]. ^ Amaro-Seoane, P.; Konstantinidis, S.; Brem, P.; Catelan, M. Mergers of multimetallic globular clusters: the role of dynamics. Monthly Notices of the Royal Astronomical Society. 2013, 435 (1): 809–821. Bibcode:2013MNRAS.435..809A. arXiv:1108.5173. doi:10.1093/mnras/stt1351. ^ This Star Cluster Is Not What It Seems. www.eso.org. European Southern Observatory. [12 September 2014]. ^ Elmegreen, B. G.; Efremov, Y. N. A Universal Formation Mechanism for Open and Globular Clusters in Turbulent Gas. Astrophysical Journal. 1999, 480 (2): 235–245. Bibcode:1997ApJ...480..235E. doi:10.1086/303966. ^ Burkert, Andreas; Tremaine, Scott. A correlation between central supermassive black holes and the globular cluster systems of early-type galaxies. April 1, 2010. arXiv:1004.0137 [astro-ph.CO]. A possible explanation is that both large black-hole masses and large globular cluster populations are associated with recent major mergers. ^ Young and Exotic Stellar Zoo: ESO's Telescopes Uncover Super Star Cluster in the Milky Way. ESO. 2005-03-22 [2007-03-20]. ^ ESA/Hubble Picture of the Week. Engulfed by Stars Near the Milky Way’s Heart. [28 June 2011]. ^ Talpur, Jon. A Guide to Globular Clusters. Keele University. 1997 [2007-04-25]. ^ Sigurdsson, Steinn. Planets in globular clusters?. Astrophysical Journal. 1992, 399 (1): L95–L97. Bibcode:1992ApJ...399L..95S. doi:10.1086/186615. ^ Arzoumanian, Z.; Joshi, K.; Rasio, F. A.; Thorsett, S. E.; Joshi; Rasio; Thorsett. Orbital Parameters of the PSR B1620-26 Triple System. Proceedings of the 160th colloquium of the International Astronomical Union. 1999, 105: 525. Bibcode:1996astro.ph..5141A. arXiv:astro-ph/9605141. ^ Bekki, K.; Freeman, K. C. Formation of ω Centauri from an ancient nucleated dwarf galaxy in the young Galactic disc. Monthly Notices of the Royal Astronomical Society. December 2003, 346 (2): L11–L15. Bibcode:2003MNRAS.346L..11B. arXiv:astro-ph/0310348. doi:10.1046/j.1365-2966.2003.07275.x. ^ Forbes, Duncan A.; Bridges, Terry. Accreted versus In Situ Milky Way Globular Clusters. January 25, 2010. arXiv:1001.4289 [astro-ph.GA]. ^ van der Marel, Roeland. Black Holes in Globular Clusters. Space Telescope Science Institute. 2002-03-03 [2006-06-08]. （原始内容存档于2012-05-25）. 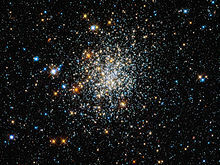 ^ Spot the Difference — Hubble spies another globular cluster, but with a secret. Picture of the Week. ESA/Hubble. [5 October 2011]. ^ Green, Simon F.; Jones, Mark H.; Burnell, S. Jocelyn. An introduction to the sun and stars. Cambridge University Press. 2004: 240. ISBN 0-521-54622-2. ^ 39.0 39.1 van Albada, T. S.; Baker, Norman. On the Two Oosterhoff Groups of Globular Clusters. Astrophysical Journal. 1973, 185: 477–498. Bibcode:1973ApJ...185..477V. doi:10.1086/152434. ^ Buonanno, R., Corsi, C.E., Pulone, L. ESO 280-SC06. Astronomical Journal. 1995 [2014-04-19]. ^ ESO 280-SC06. 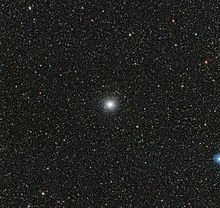 Globular cluster ESO 280-SC06, in Ara. [2014-04-19]. ^ Harris, W. E. Spatial structure of the globular cluster system and the distance to the galactic center. Astronomical Journal. 1976, 81: 1095–1116. Bibcode:1976AJ.....81.1095H. doi:10.1086/111991. ^ Lee, Y. W.; Yoon, S. J. On the Construction of the Heavens. An Aligned Stream of Low-Metallicity Clusters in the Halo of the Milky Way. 2002, 297 (5581): 578–81. Bibcode:2002Sci...297..578Y. PMID 12142530. arXiv:astro-ph/0207607. doi:10.1126/science.1073090. ^ Leonard, P. J. t. Stellar collisions in globular clusters and the blue straggler problem. The Astrophysical Journal. 1989, 98: 217. Bibcode:1989AJ.....98..217L. doi:10.1086/115138. ^ 45.0 45.1 Rubin, V. C.; Ford, W. K. J. A Thousand Blazing Suns: The Inner Life of Globular Clusters. Mercury. 1999, 28: 26 [2006-06-02]. Bibcode:1999Mercu..28d..26M. ^ Savage, D.; Neal, N.; Villard, R.; Johnson, R.; Lebo, H. Hubble Discovers Black Holes in Unexpected Places. HubbleSite (Space Telescope Science Institute). 2002-09-17 [2006-05-25]. ^ Finley, Dave. Star Cluster Holds Midweight Black Hole, VLA Indicates. NRAO. 2007-05-28 [2007-05-29]. ^ Baumgardt, Holger; Hut, Piet; Makino, Junichiro; McMillan, Steve; Portegies Zwart, Simon. On the Central Structure of M15. Astrophysical Journal Letters. 2003, 582 (1): 21. Bibcode:2003ApJ...582L..21B. arXiv:astro-ph/0210133. doi:10.1086/367537. ^ Baumgardt, Holger; Hut, Piet; Makino, Junichiro; McMillan, Steve; Portegies Zwart, Simon. A Dynamical Model for the Globular Cluster G1. Astrophysical Journal Letters. 2003, 589 (1): 25 [2006-09-13]. Bibcode:2003ApJ...589L..25B. arXiv:astro-ph/0301469. doi:10.1086/375802. ^ Cosmic fairy lights. ESA/Hubble Picture of the Week. [29 April 2014]. ^ Shapley, H. Studies based on the colors and magnitudes in stellar clusters. I,II,III. Astrophysical Journal. 1917, 45: 118–141. Bibcode:1917ApJ....45..118S. doi:10.1086/142314. ^ Martin, Schwarzschild. Structure and Evolution of Stars. Princeton University Press. 1958. ISBN 0-486-61479-4. ^ Sandage, A.R. Observational Approach to Evolution. III. Semiempirical Evolution Tracks for M67 and M3. Astrophysical Journal. 1957, 126: 326. Bibcode:1957ApJ...126..326S. doi:10.1086/146405. ^ Hansen, B. M. S.; Brewer, J.; Fahlman, G. G.; Gibson, B. K.; Ibata, R.; Limongi, M.; Rich, R. M.; Richer, H. B.; Shara, M. M.; Stetson, P. B. The White Dwarf Cooling Sequence of the Globular Cluster Messier 4. Astrophysical Journal Letters. 2002, 574 (2): L155. Bibcode:2002ApJ...574L.155H. arXiv:astro-ph/0205087. doi:10.1086/342528. ^ Majaess, D. Nearby Ancient Star is Almost as Old as the Universe. Universe Today. February 23, 2013 [November 29, 2014]. ^ Ashes from the Elder Brethren — UVES Observes Stellar Abundance Anomalies in Globular Clusters (新闻稿). 2001-03-01 [2006-05-26]. ^ Leonard, Peter J. T. Stellar collisions in globular clusters and the blue straggler problem. The Astronomical Journal. 1989, 98: 217–226. Bibcode:1989AJ.....98..217L. doi:10.1086/115138. ^ Appearances can be deceptive. ESO Picture of the Week. [12 February 2013]. 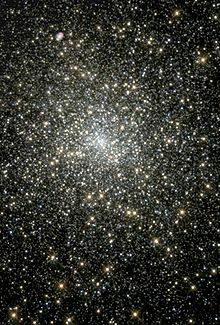 ^ 62.0 62.1 62.2 Benacquista, Matthew J. Globular cluster structure. Living Reviews in Relativity. 2006 [2006-08-14]. ^ Staneva, A.; Spassova, N.; Golev, V. The Ellipticities of Globular Clusters in the Andromeda Galaxy. Astronomy and Astrophysics Supplement. 1996, 116 (3): 447–461. Bibcode:1996A&AS..116..447S. doi:10.1051/aas:1996127. ^ Frenk, C. S.; White, S. D. M. The ellipticities of Galactic and LMC globular clusters. Monthly Notices of the Royal Astronomical Society. 1980, 286 (3): L39–L42. Bibcode:1997astro.ph..2024G. arXiv:astro-ph/9702024. doi:10.1093/mnras/286.3.l39. ^ Kenneth Janes. Star Clusters (PDF). Encyclopedia of Astronomy and Astrophysics: 2. November 2000 [26 March 2014]. ^ Buonanno, R.; Corsi, C. E.; Buzzoni, A.; Cacciari, C.; Ferraro, F. R.; Fusi Pecci, F.; Corsi; Buzzoni; Cacciari; Ferraro; Fusi Pecci. 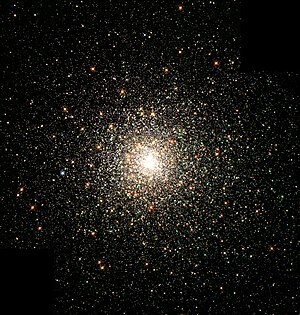 The Stellar Population of the Globular Cluster M 3. I. Photographic Photometry of 10 000 Stars. Astronomy and Astrophysics. 1994, 290: 69–103. Bibcode:1994A&A...290...69B. ^ Da Costa, G. S.; Freeman, K. C. The structure and mass function of the globular cluster M3. ApJ. May 1976, 206 (1): 128–137 [6 December 2014]. Bibcode:1976ApJ...206..128D. doi:10.1086/154363. ^ Brosche, P.; Odenkirchen, M.; Geffert, M. Instantaneous and average tidal radii of globular clusters. New Astronomy. March 1999, 4 (2): 133–139 [7 December 2014]. Bibcode:1999NewA....4..133B. doi:10.1016/S1384-1076(99)00014-7. ^ Djorgovski, S.; King, I. R. A preliminary survey of collapsed cores in globular clusters. Astrophysical Journal. 1986, 305: L61–L65. Bibcode:1986ApJ...305L..61D. doi:10.1086/184685. ^ Ashman, Keith M.; Zepf, Stephen E. Globular cluster systems. Cambridge astrophysics series 30. Cambridge University Press. 1998: 29. ISBN 0-521-55057-2. ^ Binney, James; Merrifield, Michael. Galactic astronomy. Princeton series in astrophysics. Princeton University Press. 1998: 371. ISBN 0-691-02565-7. ^ Vanbeveren, D. The influence of binaries on stellar population studies. Astrophysics and space science library 264. Springer. 2001: 397. ISBN 0-7923-7104-6. ^ Spitzer, L., Jr. P. Hut and S. McMillan, 编. Dynamical Evolution of Globular Clusters. The Use of Supercomputers in Stellar Dynamics, Proceedings of a Workshop Held at the Institute for Advanced Study 267 (Princeton, USA: Springer-Verlag, Berlin Heidelberg New York). June 2–4, 1986: 3. Bibcode:1986LNP...267....3S. doi:10.1007/BFb0116388. ^ Gnedin, Oleg Y.; Lee, Hyung Mok; Ostriker, Jeremiah P. Effects of Tidal Shocks on the Evolution of Globular Clusters. The Astrophysical Journal. September 1999, 522 (2): 935–949. Bibcode:1999ApJ...522..935G. arXiv:astro-ph/9806245. doi:10.1086/307659. ^ Bahcall, John N.; Piran, Tsvi; Weinberg, Steven. Dark matter in the universe 2nd. World Scientific. 2004: 51. ISBN 981-238-841-9. ^ Stellar Sorting in Globular Cluster 47. Hubble News Desk. 2006-10-04 [2006-10-24]. ^ Baldwin, Emily. Old globular clusters surprisingly young. Astronomy Now Online. 2008-04-29 [2008-05-02]. ^ Secker, Jeff. A Statistical Investigation into the Shape of the Globular cluster Luminosity Distribution. Astronomical Journal. 1992, 104 (4): 1472–1481. Bibcode:1992AJ....104.1472S. doi:10.1086/116332. ^ Benacquista, Matthew J. Relativistic Binaries in Globular Clusters: 5.1 N-body. Living Reviews in Relativity. 2002-02-20 [2006-10-25]. ^ Hut, Piet; Makino, Jun. Maya Open Lab. The Art of Computational Science. [2012-03-26]. ^ Heggie, D. C.; Giersz, M.; Spurzem, R.; Takahashi, K. Johannes Andersen, 编. Dynamical Simulations: Methods and Comparisons. Highlights of Astronomy Vol. 11A, as presented at the Joint Discussion 14 of the XXIIIrd General Assembly of the IAU, 1997 (Kluwer Academic Publishers). 1998: 591. Bibcode:1997astro.ph.11191H. ^ Benacquista, Matthew J. Relativistic Binaries in Globular Clusters. Living Reviews in Relativity. 2006, 9. ^ J. Goodman and P. Hut (编). Dynamics of Star Clusters (International Astronomical Union Symposia). Springer. 1985. ISBN 90-277-1963-2. ^ Hasani Zonoozi, Akram; 等. Direct N-body simulations of globular clusters – I. Palomar 14. Monthly Notices of the Royal Astronomical Society. March 2011, 411 (3): 1989–2001. Bibcode:2011MNRAS.411.1989Z. arXiv:1010.2210. doi:10.1111/j.1365-2966.2010.17831.x. ^ Zhou, Yuan; Zhong, Xie Guang. The core evolution of a globular cluster containing massive black holes. Astrophysics and Space Science. June 1990, 168 (2): 233–241. Bibcode:1990Ap&SS.168..233Y. doi:10.1007/BF00636869. ^ Pooley, Dave. Globular Cluster Dynamics: the importance of close binaries in a real N-body system. UW-Madison. [2008-12-11]. 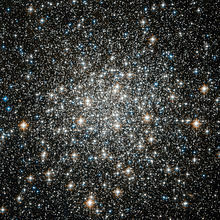 ^ Globular Cluster M10. ESA/Hubble Picture of the Week. [18 June 2012]. ^ Ortolani, S.; Bica, E.; Barbuy, B.; Bica; Barbuy. BH 176 and AM-2: globular or open clusters?. Astronomy and Astrophysics. 1995, 300: 726. Bibcode:1995A&A...300..726O. ^ 89.0 89.1 Huxor, A. P.; Tanvir, N. R.; Irwin, M. J.; R. Ibata. A new population of extended, luminous, star clusters in the halo of M31. Monthly Notices of the Royal Astronomical Society. 2005, 360 (3): 993–1006. Bibcode:2005MNRAS.360.1007H. arXiv:astro-ph/0412223. doi:10.1111/j.1365-2966.2005.09086.x. ^ Lauchner, A.; Wilhelm, R.; Beers, T. C.; Allende Prieto, C. A Search for Kinematic Evidence of Tidal Tails in Globular Clusters. American Astronomical Society Meeting 203, #112.26. December 2003. Bibcode:2003AAS...20311226L. ^ Di Matteo, P.; Miocchi, P.; Capuzzo Dolcetta, R. Formation and Evolution of Clumpy Tidal Tails in Globular Clusters. American Astronomical Society, DDA meeting #35, #03.03. May 2004. Bibcode:2004DDA....35.0303D. ^ Staude, Jakob. Sky Survey Unveils Star Cluster Shredded By The Milky Way. Image of the Week. Sloan Digital Sky Survey. 2002-06-03 [2006-06-02]. ^ Kravtsov, V. V. Globular Clusters and Dwarf Spheroidal Galaxies of the Outer Galactic Halo: on the Putative Scenario of their Formation (PDF). Astronomical and Astrophysical Transactions. 2001, 20 (1): 89–92 [2010-03-02]. Bibcode:2001A&AT...20...89K. doi:10.1080/10556790108208191. ^ Nelson Caldwell (CfA), Jay Strader (Michigan St), Aaron J. Romanowsky (San Jose St/Santa Cruz), Jean P. Brodie (Santa Cruz), Ben Moore (Zurich), Jurg Diemand (Zurich), Davide Martizzi (Berkeley). A Globular Cluster Toward M87 with a Radial Velocity < -1000 km/s: The First Hypervelocity Cluster. 25 February 2014. Bibcode:2014ApJ...787L..11C. arXiv:1402.6319. doi:10.1088/2041-8205/787/1/L11. ^ Gonzalez, Guillermo; Brownlee, Donald; Ward, Peter. The Galactic Habitable Zone: Galactic Chemical Evolution. Icarus. July 2001, 152 (1): 185–200. Bibcode:2001Icar..152..185G. arXiv:astro-ph/0103165. doi:10.1006/icar.2001.6617. ^ Sigurdsson, S.; Stairs, I. H.; Moody, K.; Arzoumanian, K. M. Z.; Thorsett, S. E. Fischer, D.; Rasio, F. A.; Thorsett, S. E.; Wolszczan, A., 编. Planets Around Pulsars in Globular Clusters. Extreme Solar Systems, ASP Conference Series, proceedings of the conference held 25–29 June 2007, at Santorini Island, Greece. 2008, 398: 119. Bibcode:2008ASPC..398..119S. ^ Spurzem, R.; 等. Dynamics of Planetary Systems in Star Clusters. The Astrophysical Journal. May 2009, 697 (1): 458–482. Bibcode:2009ApJ...697..458S. arXiv:astro-ph/0612757. doi:10.1088/0004-637X/697/1/458. Binney, James; Tremaine, Scott. Galactic Dynamics First. Princeton, New Jersey: Princeton University Press. 1987. ISBN 0-691-08444-0. Heggie, Douglas; Hut, Piet. The Gravitational Million-Body Problem: A Multidisciplinary Approach to Star Cluster Dynamics. Cambridge University Press. 2003. ISBN 0-521-77486-1. Spitzer, Lyman. Dynamical Evolution of Globular Clusters. Princeton, New Jersey: Princeton University Press. 1987. ISBN 0-691-08460-2.